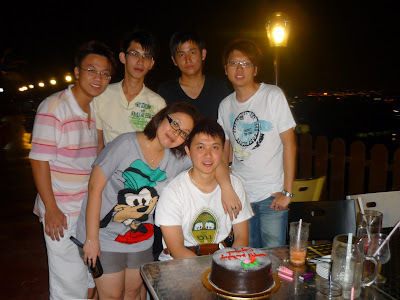 The guests who attended the dinner included my beloved housemates - Steven, Jeff, Ed n also our friends, Kok Sang & Teck. The cafe is located in a club house. The environment was pretty impressive. The only thing was - too bad there was no hot chicks in Bikini that night. LOL! Its time for BIRTHDAY SONG!! Baby is making a LONG wish! 0 comments on "Happie Buffday My Love"